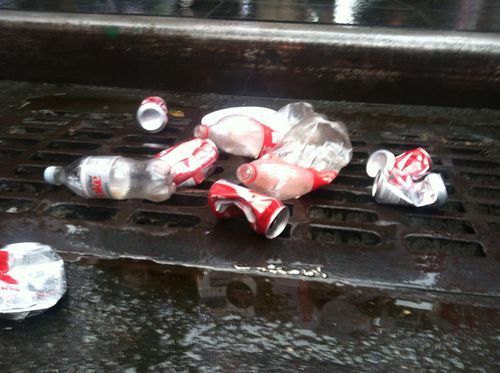 Today, the gutters of New York City ran red with…empty Coca-Cola bottles? 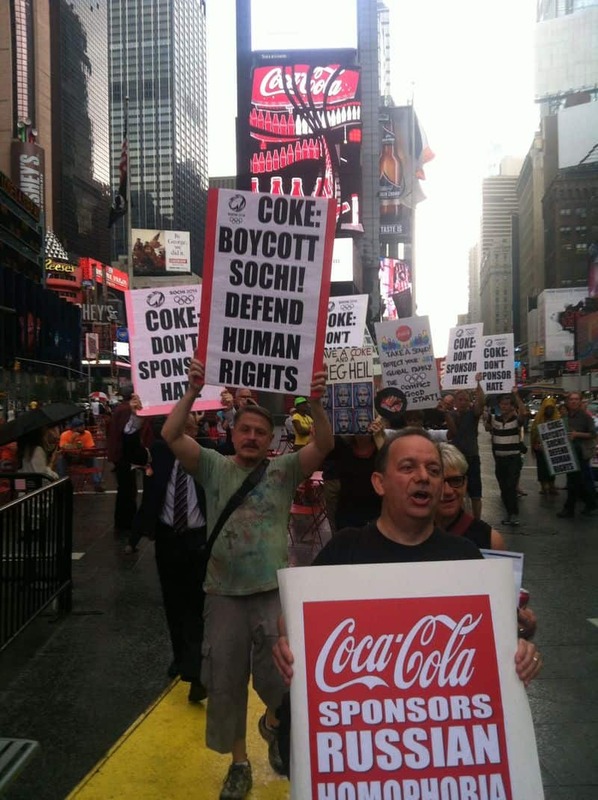 At noon on Wednesday, protestors gathered in Times Square to demand that Coca-Cola rescind its sponsorship of the 2014 Winter Olympics in Sochi, Russia. 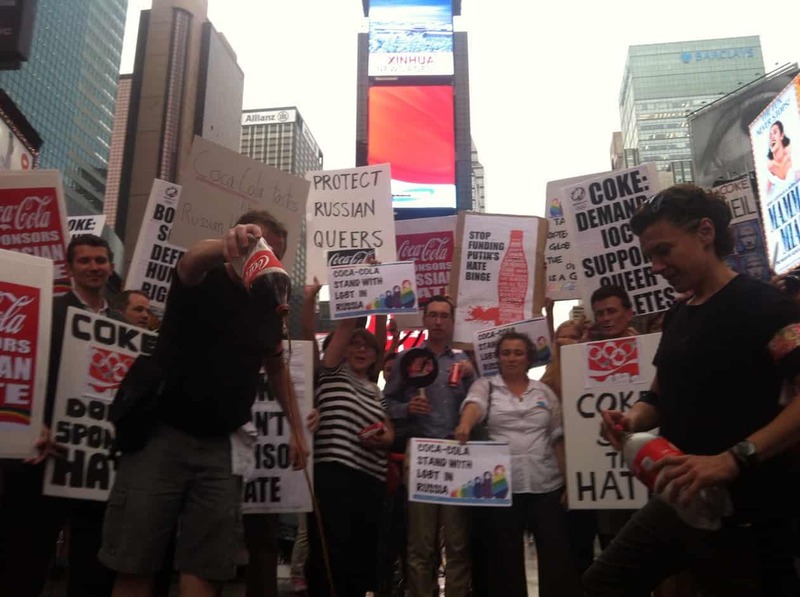 The crowd was made up of LGBT groups who oppose Coke's involvement with the Olympic Games due to the anti-gay propaganda laws currently in place in Russia, and thus, Coca-Cola's transitive support of those laws. The protest, as Towleroad previously reported, was sponsored by Queer Nation, the group which also boycotted Russian vodka starting back in July. 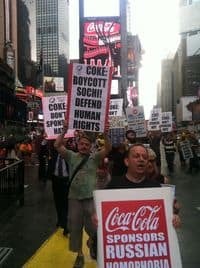 Gay groups charge the beverage giant of sponsoring hate and will dump Coke into the street and will crush Coke cans to protest of the company’s continuing silence on Russia’s anti-LGBT law and to demand that it immediately withdraw its corporate sponsorship of the Games. Protestors will use the hashtag #DumpCoke on all social media channels. Images courtesy of Scott Wooledge. Withdraw its sponsorship of the 2014 Winter Games in Russia. Publish and publicize its LGBT employment policies on its Russian website in Russian and on physical bulletin boards and websites at all Coca-Cola owned and operated facilities. Conduct periodic company-wide sensitivity trainings about its LGBT employment policies worldwide. Institute a long-range policy to widely distribute its LGBT employment policies in human resources documentation and internal communications at all owned and operated facilities worldwide. Require that all Coca-Cola bottlers, distributors and vendors implement LGBT employment policies as a condition of their contract with The Coca-Cola Company. Only time will tell how these fraught Olympic Games will progress, and what impact corporate sponsorships, protests, and media coverage will have on the LGBT community. Do you thin it is likely that Coca-Cola, and other corporations, will retract their sponsorship of the Games? Sound off in the comments below.